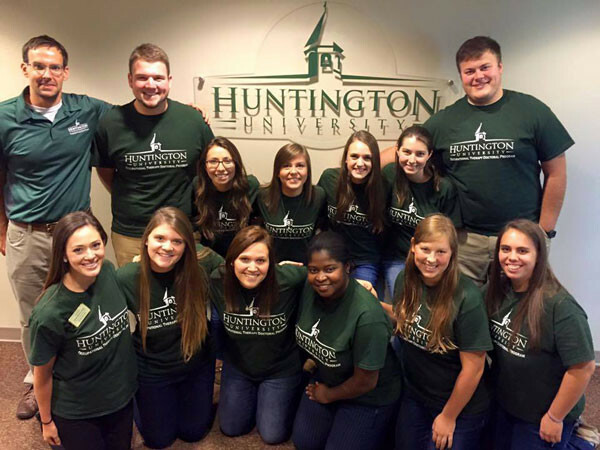 Huntington University has a number of job positions open. You can read about them here. The complete Huntington University chapel program on November 19, 2015, when four generations of the Merillat family–including matriarch Ruth Merillat–participated in a panel discussion led by HU president Sherilyn Emberton. Ruth Merillat will celebrate her 95th birthday on January 18, 2016. Over the years she and her late husband, Orville, who passed away in 1999, have been a huge blessing to Huntington University and to many United Brethren churches and ministries across the world. Orville and Ruth started a cabinet company in 1946 which grew to become Merillat Industries, the world’s largest cabinet manufacturer. On November 19, Huntington University hosted four generations of the Merillat family on campus. Ruth Merillat, Richard & Lynette Merillat, and Tricia (Merillat) McGuire, along with her two daughters, were part of a panel on the subject of giving. 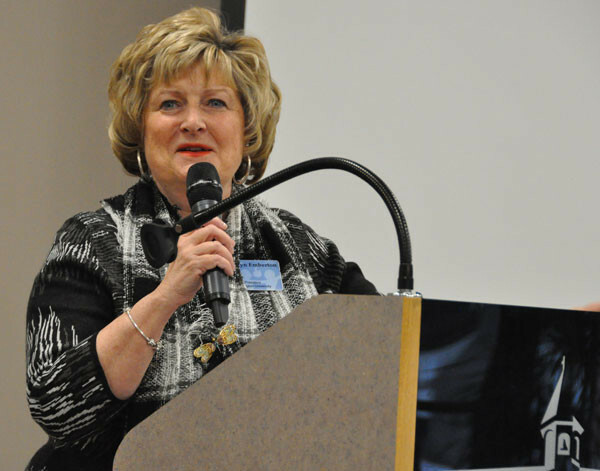 Dr. Sherilyn Emberton, president of HU, led the panel discussion during the morning chapel. The video above includes the entire chapel. The Merillats, members of Trenton Hills UB church in Adrian, Mich., first gave to Huntington University in 1968–a gift of cabinets for a house the college owned. In 1972 they led the campaign for the new Merillat Physical Education Complex, and gave toward nearly every building constructed in the 1980s and 1990s. Three buildings on Huntington University’s campus are named after the Merillat family: The Merillat Complex (PLEX), the Merillat Centre for the Arts (MCA) and RIchLyn Library (a combination of the names Richard and Lynette). The Merillats have contributed toward many other Christians organizations, and to numerous United Brethren causes–missionaries, church construction, church staff, national office staff and equipment, and much more. 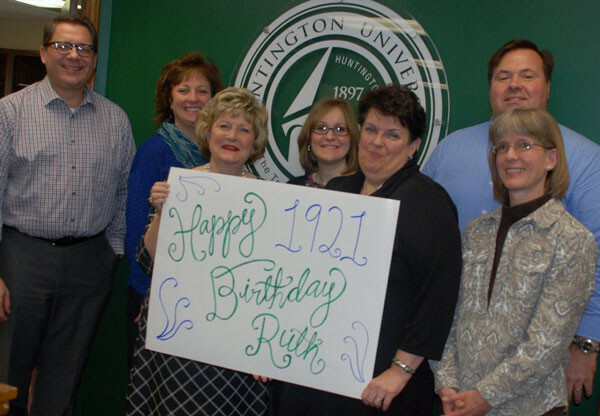 Dr. Sherilyn Emberton (third from left) and other Huntington University staff wishing Ruth Merillat a happy 95th birthday. 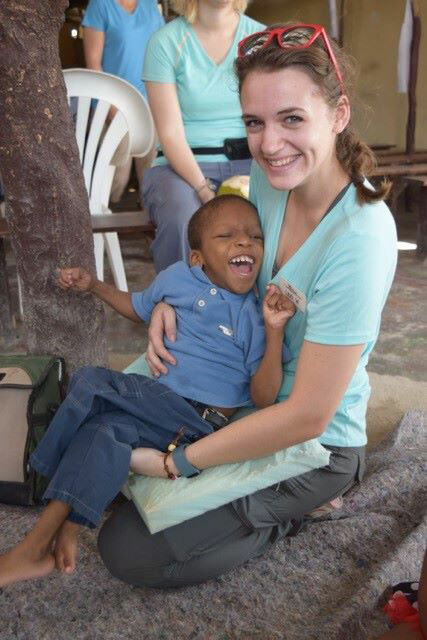 A group of Huntington University Occupational Therapy students decided to spend their January Term in Haiti. This trip is about offering mobility options and fittings to Haitians in need. This is the second year that a group of Occupational Therapy students have made this trip. Nate Short, Assistant Professor of Occupational Therapy, has accompanied the students during both trips. HU partners with Wheels of the World, a program created by Joni and Friends International Disability Center, for this project. Michael Elkins (right) has been appointed lead pastor of New Hope Community Church in Bryan, Ohio, effective January 1, 2016. His first Sunday to preach is January 17. 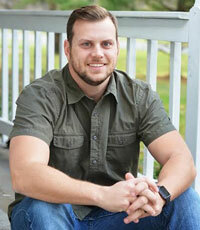 He graduated in 2007 from Baptist Bible College (Springfield, Mo.) with a degree in Pastoral Ministries, and earned a Masters in Human Services (Executive Leadership) in 2015 from Liberty University (Lynchburg, Va.). 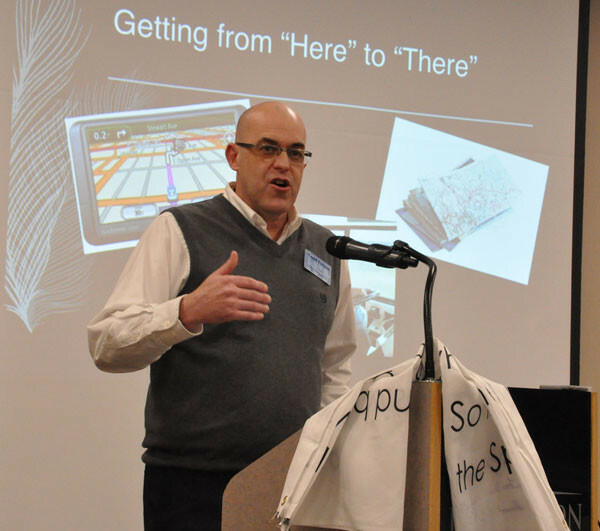 Since 2009, he has served as associate pastor of Connections Community Church in Schoolcraft, Mich. He and his wife, Michelle, have three daughters ages 2-7. The previous pastor, Pat Schwenk, left at the end of 2015 to plant a new church in Michigan (with New Hope’s blessing and support). Andy Sikora (right), senior pastor, Renew Communities (Berea, Ohio). This year at Renew Communities we did “The Last Place Christmas Projects.” It was born out of the idea that Jesus calls his followers to take last place and live as servants of all. We encouraged people to come up with people they could bless and then recruit others from inside and outside our church to participate in these projects. The video above shows some of the great stories that came out of these projects. The last story shows the completion of our 2014 Home For Christmas project where we partnered with two other local churches to buy and renovate a house for a woman and her kids graduating from a homeless/crisis shelter here in Cleveland. In 2014 we raised nearly $25,000 and had other partners give $15,000 that went to rehabbing the home. As part of the Last Place Christmas Project this year, people from Renew collected all the furnishings and tons of Christmas gifts for the family. The cluster leaders are meeting in the upper level of the Habecker Dining Commons at Huntington University. 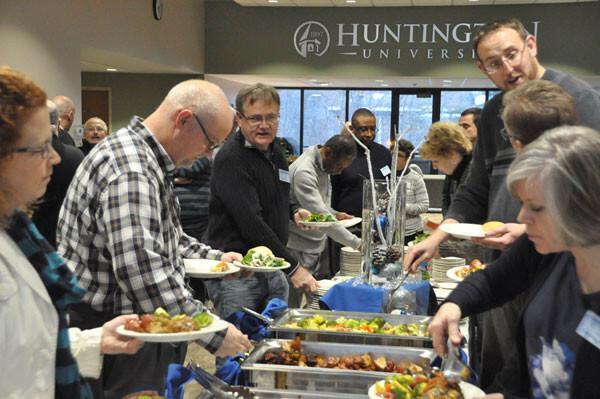 The cluster leaders, National Office staff, and spouses enjoyed a buffet dinner at Huntington University. Dr. Sherilyn Emberton, president of Huntington University, bringing greetings to the group. Bishop Todd Fetters speaking to the group. Training time on Tuesday morning. 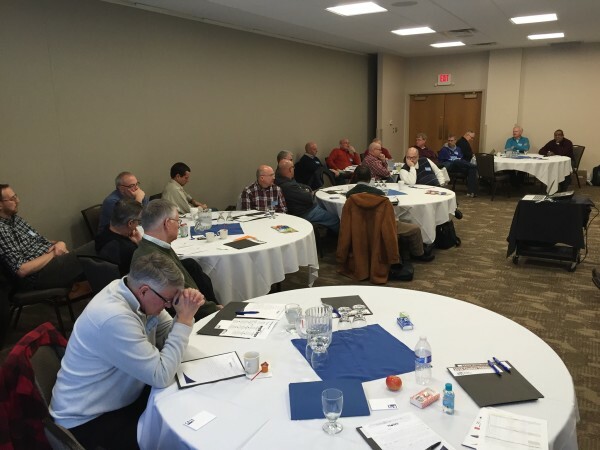 The Cluster Leader Winter Gathering is underway at Huntington University. 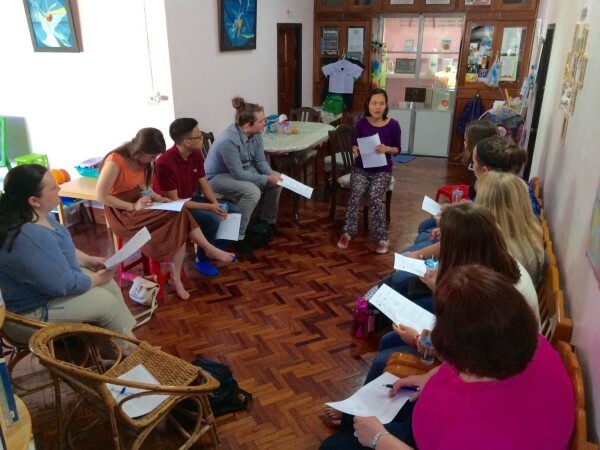 About 25 of the cluster leaders arrived on Monday. The event began with an evening meal, for which the National Office staff and spouses joined the group. The evening included from HU President Sherilyn Emberton, a message from Bishop Todd Fetters, and an extended prayer exercise led by Mark Vincenti, associate pastor of College Park Church in Huntington. The meeting continue today (Tuesday) with a training time led by Mike Dittman, who heads a ministry called Haven for the Heart. He has been working with the clusters for several years. In the photo taken soon after having traveled 40 hours, the team is receiving some pointers on Thai culture and basic phrases. Global Ministries associate directors Frank Y and Donna Hollopeter are traveling with a team from Huntington University’s Institute for TESOL Studies (ITS) in Chiang Rai, Thailand. ITS executive director Shoshannah McKinney, along with a group of seven students, are teaching English and practicing conversation in a number of schools and local ministries. Pray their words and actions would be seasoned with grace and that participants will be open to hear the good news of the gospel. 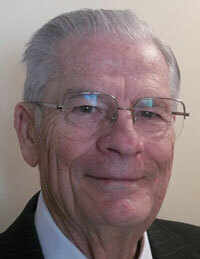 Ken Thompson has been appointed senior pastor of South Scipio UB church (Harlan, Ind. ), effective January 1, 2016. He was ordained as a UB minister in 1993 and previously pastored UB churches in Van Buren, Ind., Huntington, Ind., and Hillsdale, Ohio. Paul W. Cairl, 87 passed away January 3, 2016, in Findlay, Ohio. at Birchaven Village. He is survived by his wife, Virginia, whom he married in 1948, and a daughter. Paul was an ordained United Brethren minister, and a former administrator at Huntington College. Visitation: 3-8 pm Wednesday, January 6, 2016; and 10-11 am Thursday, January 7. Funeral: 11 am Thursday, January 7, 2016. Both visitation and funeral will be held at the Lehtomaa Funeral Home, 201 Osborn Ave. Findlay, Ohio 45840. Rev. Donald Bender, 85, passed away January 1, 2016, in Chambersburg, Pa. He graduated from Huntington College and spent his life pastoring churches in Indiana, Ohio, and Pennsylvania. He was a member of Blue Rock UB church in Waynesboro, Pa., which was one of the churches he pastored. He is survived by his wife of 65 years, Shirley, and three children. Visitation: 6-8 pm Monday, January 4. Funeral: 11am Tuesday, January 5. Both the visitation and funeral will be held at Grove-Bowersox Funeral Home, 50 South Broad Street, Waynesboro, PA. Rev. Gayle Ruble will officiate at the funeral. In lieu of flowers, memorial contributions may be made to: SpiriTrust Lutheran Home Care and Hospice, 2700 Luther Drive, Chambersburg, PA 17202 or St. Jude’s Children’s Research Hospital, 501 St Jude Place, Memphis, TN 38105 or at www.stjude.org.